A slightly strange photo. Probably mostly interesting photographers, especially if you are intrigued by reflections (and polariser filters). Others may want to keep moving, nothing to see here. 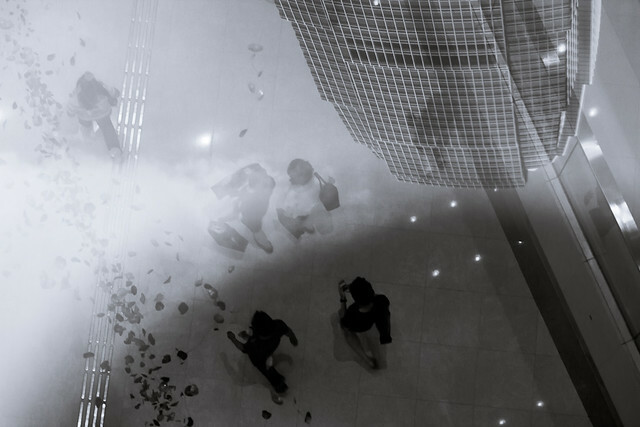 I shot this from the roof terrace of ifc mall, down through a light well to a corridor down below. The floaty things are decorations suspended from the ceiling, above the shoppers. All of that is overlaid with a reflection of ifc2 (some 400m or 1300ft tall) looming above me, and the sky. The dark crescent at the bottom is actually the shadow of my own head. In that shadow, there is no reflection to speak of, so you see the shoppers quite clearly there. I shot this in colour, but converted to black and white digitally. That conversion was very interesting. In most digital processing software, you can determine how to 'mix' the different colours to shades of grey. For example, make the blues darker shades of grey, and the reds brighter. The reflection was mostly blue sky. Now if you push the mix to render blues very light, the entire top half becomes white. The reflection becomes so bright it overpowers the view down, leaving only a (boring) reflection of ifc2 on a white sky. If on the other hand you push the blues to be very dark, the reflection almost disappears, and you have a clear view straight down. I played with that a bit and decided to mix the reflection with the view down, for a slightly disorienting, dreamy look. The curious thing was that I could regulate the amount of reflection with one slider, digitally, at home on my computer. Normally that takes a polariser filter, when you take the shot, with no options to do anything like that digital post processing. I'd always heard and believed that you cannot do polarisation in post processing. As it turns out, sometimes you can, at least if you convert to B&W. I've been very negligent... No post for months, and there was enough to post. 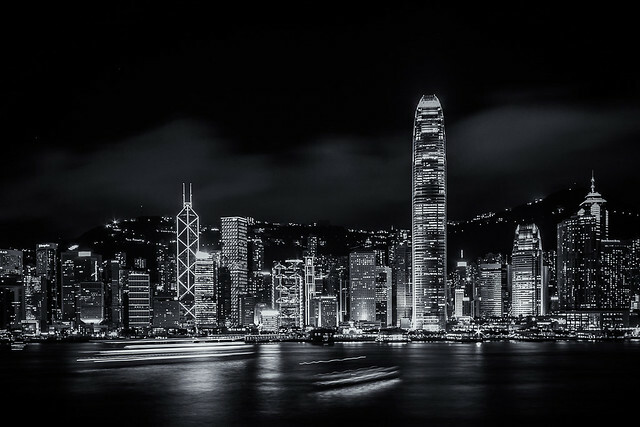 This is a long exposure from the top of a parking garage in Kowloon, across Victoria Harbour towards Hong Kong Island. The tall tower is ifc2 (International Financial Centre 2).